I’ve been seeing a therapist lately. This week I said something about how later in the season I will have to accept that I have limits to what I can do. (I have a lot of self-pity when I compare myself to others, believe me.) She said that this week I should “accept my limits” and focus on “quality, not quantity.” It’s hard to know how much quantity you’ll have with growing food and flowers. I tend to start two sixpacks of tomatoes, and I’ve been getting only 4-8 plants germinating. I have 3 of 12 cucumbers, which is actually a more manageable number for someone who has trouble getting around to harvesting. Then some get damping off or other problems. I realized yesterday that I had to stop using the little watering can that I use in my germinating greenhouse. At the base of the end sprayer (what’s that called? a rose? rosette? I forget), there’s some water that drips out in droplets that are much larger than what comes out of the end. So I’m watering one or two cells gently, while the one that I just watered is getting pounded with even more water! It’s been that way pretty much the whole season. Maybe this is why I’ve had such bad germination of zinnias and some of the small-seeded summer crops? Argh! I need to find another source of organic full-size zinnias. So I’m dragging the curly hose over from inside the garden gate, and it barely reaches, and I’m bumping into the greenhouse frame as I pull the hose tighter… It’s not good. I’m generally miserable and feeling like I need help brainstorming and implementing solutions. I guess I could try putting newly seeded trays into the “new” greenhouse, even if they’re on the low shelves, since it’s so much cooler and gets less direct sunlight. I’m just nervous that rodents would get in there and eat them the first night. As it is, I wonder if earwigs have eaten any seeds in the other greenhouse! I’ve planted most of my broccoli and cabbage in the last 10ish days, and this week I started on the dino kale. The broccoli is getting DESTROYED by flea beetles 😦 I finally pulled my onion seedlings out of the fridge (why didn’t I at least put them in a plastic bag with a damp paper towel when they arrived was it Monday or Tuesday of this week?! busy. And there’s a packet of Petaluma Gold Rush (not technically organic, but I think I’ve looked and not found them organic elsewhere) seeds in a plastic bag inside that box which I’m like, maybe I’ll just leave it there until I’m ready. 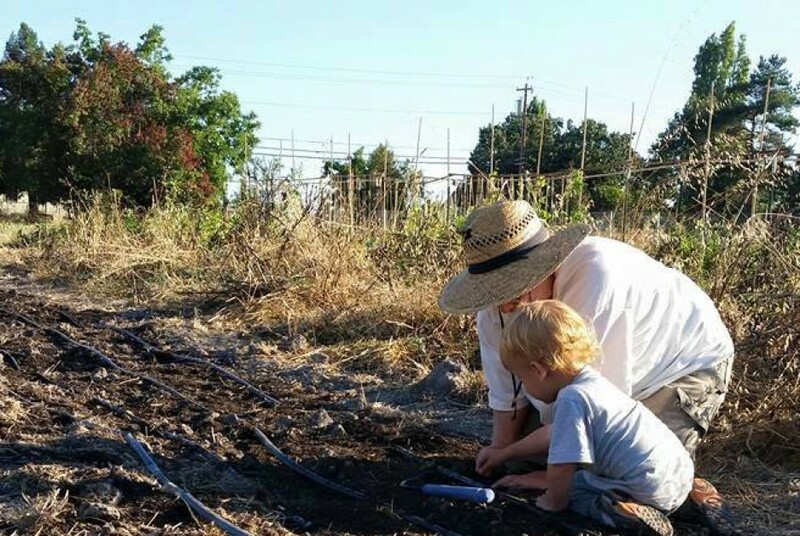 Petaluma Gold Rush bean info(accessed tonight): “Pole/Dry. Short Rounded seeded horticultural type from Peru. Introduced to San Francisco area about 1840-1841 by Adeline Azevedo Frye. Sold by Azevedo family as snap and dry bean to mining camps. The plants are vigorous, producing vines that grow up to 10 feet tall.” Petaluma is like 10 miles from here (Z and I rented a place there before we moved 3 cities to the north). So I guess that counts as a local heirloom crop. I never dealt with the seeds that I harvested last year. Limitations. Well, really I just need to set a date by or in the 2nd week in November for collecting and processing seeds. So I started planting onions yesterday along with the Dino Kale. I’ve got about 20 of the kales into the ground, and around 35 of the onions. Last night’s handful of onion seedlings was much bigger than I’d anticipated and made me a half hour later coming in from the garden. Sigh). I also put some of the onions amongst the beleaguered broccoli. Gotta keep planting, but also need to prep more beds. The ground in the next section has a big dip and I’m not sure if I/we can fix it any time soon. We have a pile of soil that, if it is moistened, could be moved to that area if we have time. I’m tempted to switch over to the summer crop area since I need to get my okra and tomatillos into the ground! And I have a few cukes and melons to transplant, too. And the dahlias are really getting rootbound. Wish me luck getting stuff done on Sunday. Z has been so stressed that he’s getting really forgetful. He needs some time to himself, but he always gives in when T says he wants to be with him. So it’s kind of his problem, but really it’s ours as a couple and family. Haven’t harvested strawberries in around 5 days. No time. PS, calf still sore. Seeing a chiro/physiotherapist a friend recommended on Tuesday. Today I potted up more broccoli (did some fridayish), all of the dino kale, the rest of the dahlias, and some thumbelina zinnias! I really got into a groove after a while, I felt, but I still only did 3 trays of 3.5 inch pots and 1 tray of 2.5 inch pots. Things are always inefficient, especially when it’s hard to find level ground to set up my folding table on, and when I realize pretty quickly that I can’t work comfortably while sitting at this table- I couldn’t find a height in the middle that suited me. I regret not having used a respirator and goggles. I feel like little bits of mica or vermiculite or something are all up in my respiratory system, eyes, and skin. The potting mix – Kellogg Raised Bed and Potting Mix (first time using it, from a huge bag!) – was very dry after it having been stored on a table in the yard for a week or two. I used that to fill most of the pots and then I added Black Gold from an open bag to help for right around the plants. They had been started in the Black Gold. Some more recent seedlings were started with Kellogg’s Patio Plus. I think the KPP holds moisture better in the heat. So many more things to pot up. And I need to start more summer crops! I saw a black eyed Susan coming up this weekend. I seeded those things on like April 11th. They sure are taking a long time to come up! Z got me a 30″ high shelving unit to extend my tray storage space in the greenhouse. I have room for 2 more trays on the original shelves. Adding this unit gets me space for three more). I need to find some used shelves! RIP to my cousin G, who died of cancer on the 5th. While I was inside with T, Z was sneakily putting the greenhouse up on two dollies and the wagon. Then he had me come try to help move it. He got inside the greenhouse and pushed, and I was supposed to just help direct it with the wagon handle. That was difficult, when he was pushing uphill and I really wanted to help pull. Any pulling or pushing results in a wall leaning in a scary direction. The wood is so worn out that the greenhouse is about to fall apart! So uh, we’re thinking of paying someone to basically rebuild it. I am even thinking of asking my friend’s ex-husband (I feel conflicted about him because my friend’s mentally ill son said that he had sexually abused him – but the son was/is out of touch with reality, so do I believe him? Could I have the ex-husband/ex-father-in-law only be here when T’s not home? I know that he does good work. Otherwise, I have already left a message for a guy who did a bit of work for us a couple of years ago. He’s not that thorough and he doesn’t clean up after himself very well tho.